Scientists have known for some time that the Earth's magnetic field is fading. "We can have periods without reversals for many millions of years, and we can have four or five reversals within one million years," said Yves Gallet, from Institut de Physique du Globe de Paris, France, who studies the palaeomagnetic record and estimates that the current decay started 2,000 years ago. (This is not surprising due to the current energy cycle starting 2,000 years ago) See harmonics research for more on this! 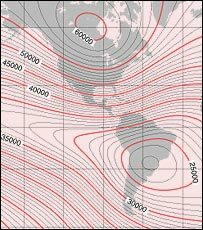 A particular weakness in the field has been observed off the coast of Brazil in the so-called Southern Atlantic Anomaly. Here, eccentricities in the Earth's core have caused a "dip" in the field, leaving it 30% weaker than elsewhere. The Earth's invisible shield could also grow back in strength. "Then sometime, maybe 10,000 years from now, the dipole will decay again and that will lead to a reversal," said Harvard physicist Jeremy Bloxham. The theme was recently taken up by Hollywood in the movie The Core, in which the Earth's core mysteriously stops spinning, effectively turning off the electromagnetic field. The movie is nonsense, scientists told BBC News Online, except that the Earth's magnetic field is generated by activity deep inside it.
" If we had the equivalent of a space probe that went into the core and made measurements for us, that would tell us a tremendous amount "
(Most of what scientists have is speculation and yet they refuse to study the harmonic energy that has an 11 year inner cycle and an outer one of 1,826 years from start to restart.) Time out guys & gals! 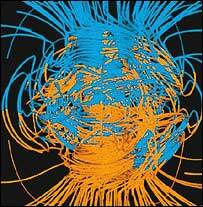 The earth's magnetic field is created by a system that is far more intricate than you think! Imagine the magnetic field lines within the core "twisting like spaghetti," said Peter L Olson, geophysics professor at Johns Hopkins University. "Depending on how it's kinked," he said, "it can be helpful or harmful." By studying sea floor sediment and lava flows, scientists can reconstruct the magnetic field patterns of the past. Iron in lava, for example, points in the direction of the then-existing field and is frozen in that orientation as the lava cools and hardens. "Chances are we're not," said Dr Bloxham. "Reversals are rare events." But there would be some bizarre readjustment. Prior to Earth's poles reestablishing themselves, a period of disorder would produce multiple poles, according to Dr Bloxham, which may make backwoods camping tricky. "Getting around using a magnetic compass would be a more complicated endeavor," he said. A collapse would also produce a great increase in auroral activity - the beautiful display of lights generated by solar particles that follow the magnetic field lines down into the atmosphere. And there would be plenty of time to grab a camera - the reversal is gradual. "They'd go through many generations in the period in which the field was entering the phase of reversal," said Dr Bloxham. "Presumably they would learn new behavior patterns to accommodate it." As for the ozone layer - which was thought to be vulnerable without a protective shield - the effects would be negligible unless there was a super-solar proton event, said Charles H Jackman, an atmospheric physicist at the US space agency's Goddard Flight Center, referring to the high-energy radiation that can accompany solar flares. (This also can occur in reduced magnetic flux as the radiation can penetrate a weaker field.) Bit like thinner paper lets more sunlight through it! "Chlorofluorocarbons have a much longer lifetime in the atmosphere than does the nitric oxide and its associated constituents," he said. But all these scenarios are of an indeterminate future. The Earth's interior will remain unexplored for a long time to come - only in science fiction can humans or their equipment survive the 5,500 Celsius temperature in the core to study its activity. "If we had the equivalent of a space probe that went into the core and made measurements for us, that would tell us a tremendous amount," said Dr Bloxham. "Hollywood may be able to do these things, but we can't."